The CENTER 260 is the perfect instrument for diagnostics and maintenance in areas with low current measurement requirements. 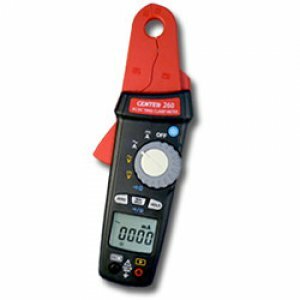 It measures both AC and DC current with a very stable 1 mA resolution. It is the ideal choice not only in general industrial applications, but also in utility, automotive, aviation and marine applications to measure standby or leakage currents in the mA range right up to 100A, AC or DC. The backlit LCD and bright LED flashlight make it easier to work in dimly lit locations. The narrow jaw, angled for easier maneuverability makes it easy to select the right wire in confined spaces. Auto power-off will save your battery when you forget to! The Center 260 is a well made and truly versatile hi-res clamp for a wide range of users.